first peasant: "Who's that, then?" 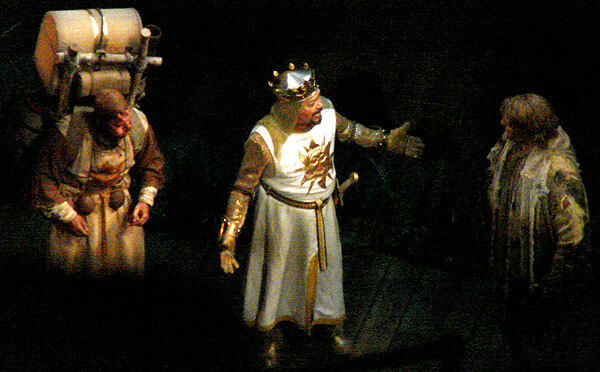 second peasant: "I dunno, must be a king"
second peasant: "He hasn't got sh*t all over him"
I walk around perpetually with a Monty Pythonesque view of the world, a joyous by-product of being immersed in the 1969-74 BBC TV comedy series when it showed on PBS while I was in High School later in the 70's. I still have friends (doesn't every guy?) with whom I can spontaneously break into about any of the skits like the one from which the lines below the first picture are taken. Doesn't that make me desirable? Throw in being a trekkie and it's no wonder I'm a catch. 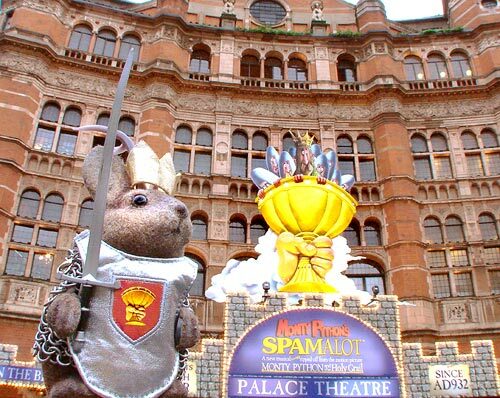 In retrospect, it was surprising that, being in London, it didn't immediately occur to me to go see Spamalot, the play "Lovingly ripped off from the classic film comedy Monty Python and the Holy Grail", as their publicity states. Fortunately, one advantage of a travel companion is to remind you of the obvious opportunities at hand, when you've gotten bogged down in other details. 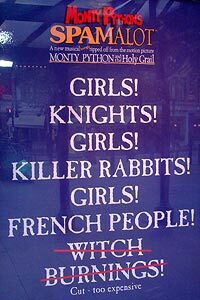 And how could we resist a musical with girls, knight, girls, killer rabbits, girls and French people? After shopping around a bit, I got two tickets for 18.50 pounds a piece. They weren't great, as a matter of fact they were in the highest balcony (The Palace has three different levels above the floor) and in the last row, at an edge, but they were all that was left for that night. After getting the tickets, it was time to do a little research to maximize the lasting enjoyment of the experience. 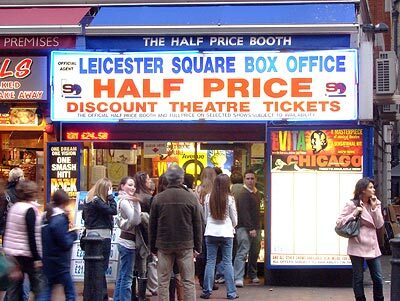 I went to the box office and asked if the actors ever stuck around for autographs and pics. You know what I was thinking. 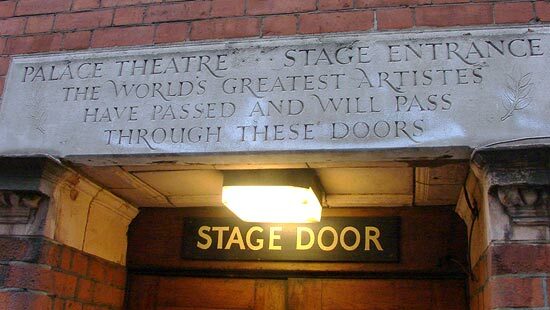 A helpful young gent told me to go to this stage door after the show and hang 'round a bit. Arriving a bit early at the theatre, I had a chance to appreciate the facade. 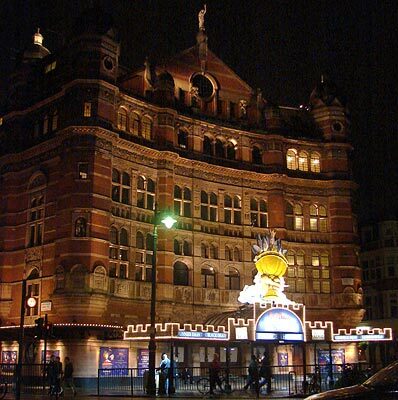 The Palace Theatre at the corner of Shaftesbury Avenue and Charing Cross Road(on the west side of Cambridge Circus) was finished in 1891 as the Royal English Opera House - a venture that soon flopped. After a few changes and a sale, it was renamed the Palace Theatre in 1911. 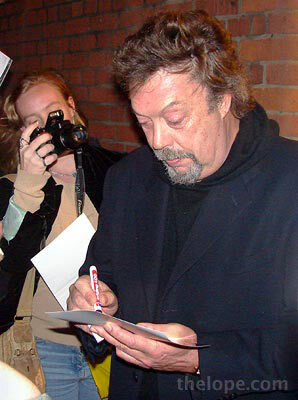 Tim Curry (right) has played King Arthur through the play's opening in Chicago in 2004, its move to Broadway in 2005 and its London opening on October 2, 2006, just about three weeks before we saw it. He is scheduled to continue in the role until sometime in early 2007 when another actor is slated to take over. Curry attained cult status with his role as Dr. Frank N. Furter in the flick, The Rocky Horror Picture Show (1975); his character was a "sweet transvestite from transexual Transylvania." 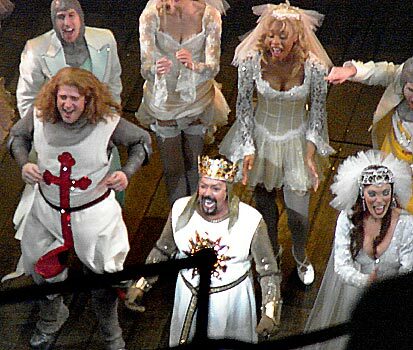 For quite a few years after, he seemed to distance himself from the role and has had quite a few more film and theater credits, including being nominated for a Tony Award last year for "best actor in a musical" for this role as Arthur in Spamalot. 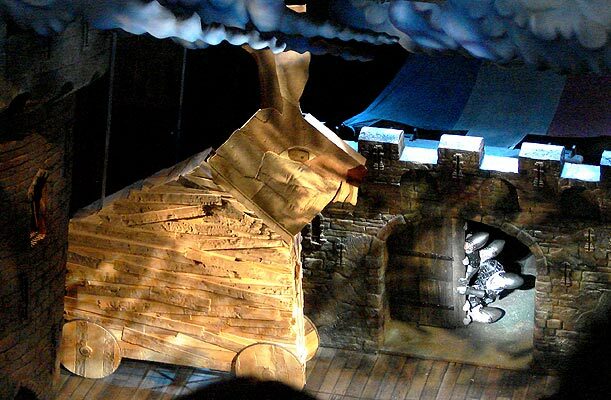 He's never won the Tony, but has been nominated three times for various roles. 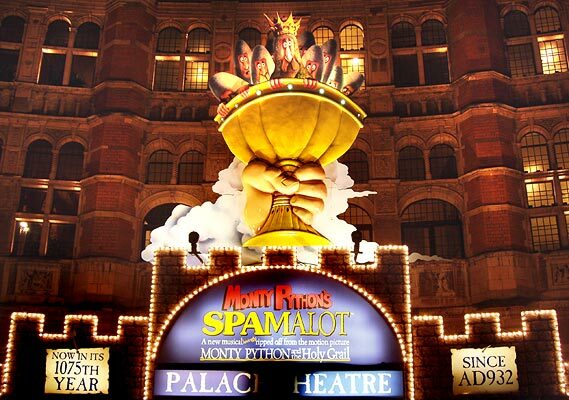 The musical is not a straight adaption of Monty Python and the Holy Grail, but then, would you expect it to be? 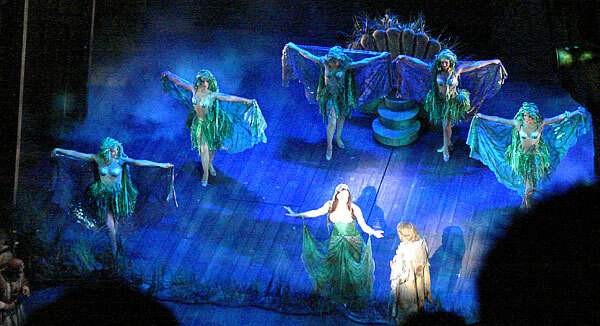 Here, The Lady of the Lake and her Laker Girls make Sir Galahad a man. 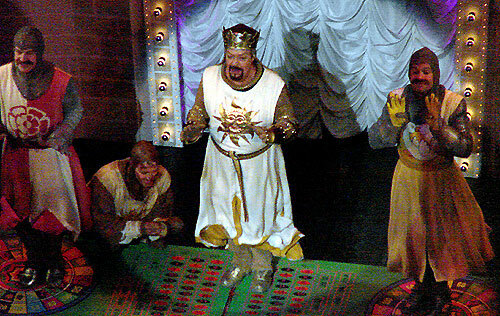 There's lots of gambling at the Vegas-like Camelot. 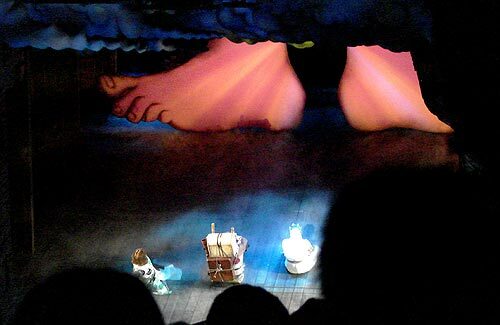 It wouldn't be a Monty Python production without the big feet of god, or at least some sort of huge feet. God has just ordered Arthur to find the holy grail and not to look up his skirt. After hurling taunts like (my favorite) "your mother was a hamster and your father smelt of elderberries" at Arthur, some French people react to finding a gift from Arthur's knights. lots of singing...lots of dancing...lots of cleavage. After the play was over, we noticed that there were opera glasses in coin-operated release mechanisms attached to the back of the seats in front of us. I think they rented for a pound or so and were probably tethered. Maybe mentioning this will give a heads-up to someone else. 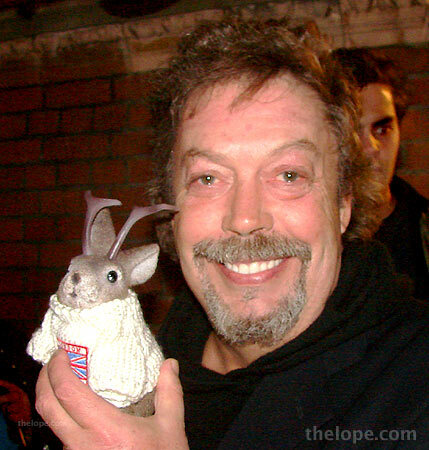 SCORE!...One photo of a Ace Jackalope and Tim Curry - A "sweet transvestite from transexual Transylvania" and an American Jackalope in London after seeing a Trojan bunny, catapulted cows and a killer rabbit. In celebration and because I like you all so much, I leave you with a link to a page with lots of quotes from Monty Python and the Holy Grail. 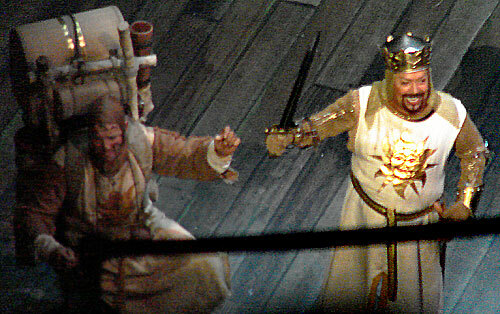 A special thanks goes out to Richard for thinking of going to a play. 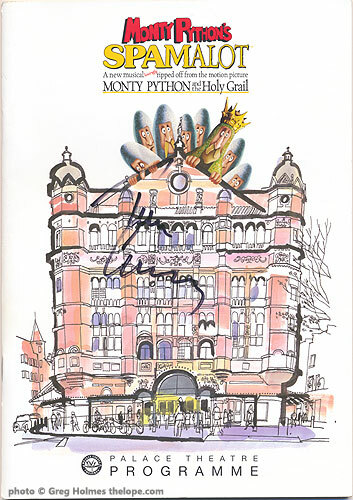 Oh - Eric Idle, John Cleese, Michael Palin, Graham Chapman, Terry Gilliam, Terry Jones and Carol Cleveland - thanks for warping me. Good Friday - Crucifix tombstone in Highgate Cemetery and a crucifix at a church in London. St Patrick's Day Megapost - Celtic crosses in London's Highgate Cemetery. Red, Gold and Almost Gone - Includes photos of London's Chinatown. Why Jackalopes Don't Play Soccer - Battered Buckyballs litter London. Christmas Leftovers - An October shopping trip through Harrods, Selfridges and Hamley's, with lots of Christmas decor pictures. Where is Ace Jackalope? (episode 13) - The game is afoot! Werelopes of London - Lycanthopic jackalopes stalk places mentioned in the Warren Zevon song, plus a few pictures of the London Underground. Dracula's London - A Halloween tribute to Bram Stoker using London locales implied in "Dracula"